According to the 2017 ‘State of Innovation Report: The Relentless Desire to Advance’, released on September 26, analysis of year-over-year research and patent activity across 12 key industries shows that the growth rate has slowed in 2016, though sectors like select hi-tech (aerospace, semiconductors, information technology) industries and life sciences witnessed strong growth. The study from Clarivate Analytics looks at 12 industries: Aerospace & Defense, Automotive, Biotechnology, Cosmetics & Wellbeing, Food, Beverage & Tobacco, Home Appliances, Information Technology, Medical Devices, Oil & Gas, Pharmaceuticals, Semiconductors and Telecommunications. The data is based on more than 18,000 journals, as well as proceedings papers, book chapters and other materials, plus information on over 71 million patents. Patent filings grew by 8 per cent y-oy – down from 14 percent last year. The slowdown was driven largely by China, which now accounts for over six of every 10 patented inventions worldwide. 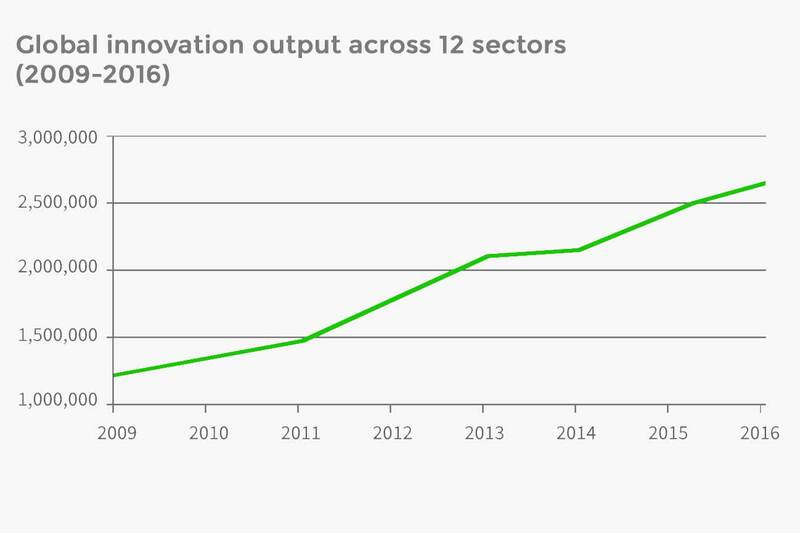 China saw a drop in patenting activity with a 9 percent year-over-year growth 2015-2016, compared to 25 percent growth 2014-2015. The report says that this could be attributable to the Chinese stall in economic growth and corresponding slackening in R&D investment (estimated gross domestic expenditure on research and development or GERD growth was 8.5 percent in 2016, down from 8.9 percent in 2015). Total scientific literature production again posted a y-o-y decline. This may reflect the recent climate of uncertainty and accompanying slowdown in research funding. Three Singapore institutions make an appearance in the report among the lists of leaders. A*STAR (Agency for Science Technology & Research) was among the top 10 biotech-in-cancer innovators in Asia between 2012 and 2016, ranked at 7th position. The Nanyang Technological University (NTU) was the 5th most prolific scientific research institutions in semiconductors in the world for the period between 2006 and 2016. The Singapore University of Technology & Design (SUTD) was the 5th most influential scientific research institution worldwide in telecommunications research between 2006 and 2016 (SUTD was established in 2009), as measured by ‘category normalised citation impact’ (CNCI). We take a deeper look at the information technology, semiconductor and telecommunications industries. However, it is important to note that boundaries between sectors are getting blurred. For instance, with the research in autonomous cars, there would be an overlap with information technology. The most influential scientific research institutions in computer science between 2006 and 2016 was the European Molecular Biology Laboratory, due to its highly cited papers in bioinformatics. Of the 12 industries analysed, information technology (IT) remained the largest, accounting for a third of all innovation in 2016, producing nearly 500,000 inventions. Growth in the sector stood at 15 per cent, building on last year’s increase of 13 percent. The State Grid Global Corporation of China was the top global innovator in IT during 2016, followed by IBM, Canon and Samsung. Computing was the most active subsector accounting for 83% of innovation. The report says that with the use of conventional silicon materials approaching physical limits, there is continuing research and innovation in new materials for chips and new ways to define computing itself such as more intelligent clever software to achieve greater computing power by leveraging cloud resources. Patenting in telecommunications slowed for the third time in three years to just 0.5 percent. The two largest subsectors, data transmission networks (27%) and mobile telephony (27%) grew by 7 per cent and 3 per cent respectively. But it was not enough to offset the contraction in five of the remaining six subsectors. That focus on data transmission is driven by the rise of big data and the Internet of Things. The growth in data traffic requires ever more powerful transmission networks, which innovators in this space are working hard to address. Six of the top 10 firms were from Asia (ZTE, Huawei, SGCC and Oppo from China, and sector leader Samsung and LG from South Korea) and the remaining four firms were from the US (Qualcomm, Intel and IBM) and Sweden (Ericsson). In academic research, Rice University was the most influential institute. Over the last seven years, semiconductor innovation has peaked and troughed. This year the sector saw a healthy 6 percent growth, compared to last year’s 3 percent y-o-y increase. The strongest growth was seen in the Memories, Films and Hybrid Circuits subsector with 19 percent growth this year. This sector includes solar paint technology. Samsung and LG lead overall in global semiconductor innovation, with six of the remaining eight slots in the top 10 going to other Asian organizations. The most prolific scientific research institution in semiconductors is the Chinese Academy of Sciences. Clarivate’s Web of Science is one of the standard tools for tracking citations. The scientific literature data was compiled using Web of Science Core Collection, a subset of the entire Web of Science worldwide source publications. The core collection indexes the contents of more than 18,000 selected and curated scientific and scholarly journals, along with proceedings papers, book chapters, and other materials, arranged into approximately 250 subject fields. The patent data was compiled using Derwent World Patents Index (DWPI), which collects information on over 71 million patents from 50 authorities around the world. CNCI of a document is calculated by dividing the actual count of citing items by the expected citation rate for documents with the same document type, year of publication and subject area. When a document is assigned to more than one subject area an average of the ratios of the actual to expected citations is used. The CNCI of an individual, institution or country, is the average of the CNCI values for all the documents in the set.